22 May 2013. Lee Rigby, a soldier of the British Army, was walking down the street in the southeast of London when he was hit by a car. Two men, later to be known as Michael Adebolajo and Michael Adebowale, stepped out of the car to hack and stab him to death using an axe and several knives. According to one of the killers, their act was justified because Muslims are dying daily by British soldiers (The Telegraph). On December 19 of 2013, the two men were found guilty of murdering Lee Rigby. A sentence shall be passed later in January 2014, but it is clear the sentence will not be mild. This terrible attack shocked not only the residents of the United Kingdom. People around the whole world shared their opinions and judgments on the case throughout the last eight months. The murder of Lee Rigby raises all kinds of questions. Is this a typical form of terrorism? If so, why dont we classify terrible events such as the murder of a 75-year old Muslim man by far right-wing people, a month prior to this murder, as terrorism as well? As usual in this modern age, Twitter is one of the platforms frequently used by people to make themselves heard, and thus alows to track popularity of trending topics (Holt). The tone of voice in tweets differs per tweet, but over-all certain conventions on positivity or negativity can be distinguished. Because, of that, our research question is the following: how does sentiment as seen on Twitter change when comparing twitter data of two major events regarding this topic? In order to answer this question, we will do a sentiment analysis to provide ourselves with the data that is required to come to certain conclusions. According to Thelwall, Buckley and Paltoglou, sentiment can be assessed for polarity  whether it is positive or negative  but can also be assessed for the strength with which a positive or negative sentiment is expressed (164). Sentiment has also seen a important recognition as emotion in aweress, recall and judgement have gain renewed attention in social media (Fox 242-244). Our sentiment analysis will be produced with the use of two tools: SentiStrength and the Twitter Capture and Analysis Toolset by the Digital Methods Initiative (DMI). [woolwich], [leerigbyRIP], [leerigby], [@TRobinsonNewEra], [@official_EDL], [@jihadwatchRS], [@AtlasShrugs], [@nickgriffinmep], [@bnp], [@BritainFirst], [@edlsupportgroup], [@anjemchoudary], [@MuslimPrisoners]. Regarding the limited time we had for this research, our two datasets both consist of four days of collected tweets. In both cases, tweets from the day of the event and three days after the event were used. Working with tweets from the day prior to the event would have been useful, but unfortunately there were no tweets collected from the day prior to the trial. Because we need similar datasets to make a good comparison, we also left out tweets from the day prior to the killing. The toolset allowed us to set time barriers, which resulted in 1.000.991 and 28.731 tweets for the killing and the trial respectively. For the killing dataset, these tweets were sent by 468.296 individual users, and 15.993 individual users sent the tweets about the trial. For our sentiment analysis, we have used SentiStrength, which is a tool to quantify the amount of sentiment shown in tweets. In this tool, words are given values, which makes it possible to see what sentiments are shown on a scale from 1 until 5 for positive and -1 until -5 for negative. 1 and -1 are neutral, 5 and -5 are very positive and negative. This way of quantification allows for sentiment to be expressed in strength, which makes the results more nuanced than they would be when positivity and negativity would be the only factors. However, because tweets are measured for their positivity as well as their negativity, the outcome is to which extent they are positive and to which extent they are negative, with the assumption that these can coexist (Thelwall et. al 2012: 164). Thelwall et. al recommend using SentiStrength for social web sentiment strength analysis, because although sarcasm is still a challenge, it is often more accurate and less labour intensive than human based coding (ibid: 171). The content of tweets in this research is measured in various ways, namely through hashtags, retweets, URLs and mentions. Hashtags are a community based convention between Twitter users through which they can categorize and highlight messages, and by this express themselves. Because people express themselves by using hashtags, this is a good way to analyze sentiment regarding a topic on Twitter (Wang et. al; 1032). The frequency of relevant terms can signal important events, and this is relevant to study because the extent to which they are important can be measured in this way (Thelwall et. al 2011: 406). Retweets give insight into trending topics, which is why this is also a good way to analyze events. Through an analysis of URLs it becomes clear what kind of links are posted on Twitter, and what kinds of content these links represent. The analysis of mentions gives insight in which voices are important in the medium, and gives us an opportunity to see whether their sentiments are representative for the overall sentiment shown regarding our topics on Twitter. However, we are only able to quantitatively measure sentiment over entire tweets, because the SentiStrength application only reads text and is not able to take into account how often a certain tweet has been sent. So for hashtags, retweets, URLs and mentions, we have interpreted the quantitative results without SentiStrength. We have collected 731 hashtags on the day of the murder with a total frequency of 228053 used hashtags. Unsurprisingly [Woolwich] was the most used hashtag with a frequency rate of 66,6%. The second most used hashtag was [EDL] which covers 6,5% of all the used hashtags. As noted above, there seems to be a fairly high level of reconsolidation as seen in the negative sentiment with regards to the EDL and hashtags that call for compassion and solidarity such as #DontRiotPlaceAPoppy (refuting the actions of the EDL) and #NotInOurName (which echoes the anti-war message of the organisation of the same name, that rose after the attacks on September 11th). One day after the murder we have the first mention of the name of the victim which takes the third place as the most used hashtag with a frequency of 1501. The hashtags are a good way of measuring what words and terms are used in the discourse around the murder, however without a closer reading of the tweets behind the hashtags it not possible to accurately measure the sentiments relating to a specific hashtag. The hashtag [London] for example takes the place of the fifth most used hashtag with a frequency of 4401, but the tag itself does not carry an inherent negative or positive sentiment. We do see more hashtags being used with regards to Islam and Muslims, but again, without a closer reading we do not know whether such hashtag are used to express negative or positive sentiments. We do see a increase in number of unique hashtags with a total of 840 while the frequency of total used hashtags decreases. Two days after the murder we can see that approximately one fifth of total number of hashtags are used with regards to the Woolwich murder in comparison with the day of the actual murder. The EDL still holds the place of the second most used hashtags and any Islam related hashtags almost disappear from the top 10 top hashtags. If one purely looks at Twitter activity and hashtags the attention, in some way, stays locked around the EDL even when related used hashtags decreases. As we can see in other categories though, the EDL is mostly talked about in a negative sense by a lot of Twitter users and retweets. What is interesting here, even though one might suspect a lot of hate related topics towards the Islam and Muslims, the most popular retweets are all about downplaying the hate instead. The day of the killing sees a large amount of retweets with the top seventeen all over a thousand retweets each (around 27.000). The nine most retweeted messages however are all about how this is not representing Muslims at all, for example: @hdck9: I've served my country all over the world. And you know what? Muslims are the friendliest most tolerant & hospitable people as claimed by a British soldier. The top retweet that day of @BBCBreaking is not a news message stating facts about the murder, but is about the Muslim Council of Britain condemning the attack. In fact most of the hate is aimed towards the English Defense League (EDL) instead (far right protest movement against Islam and sharia law) for rioting and not being a representation of the British people. This sentiment does not change during the aftermath, the EDL is still receiving the brunt of the criticism on the one hand, and people are defending Islam/muslims and paying their respects to the victim and family on the other. The day after the killing sees a top seventeen of 50.000 retweets, however not a single one of them is negative towards muslims, but rather positive towards them and negative towards the EDL. Most of the same top tweets return identically in the last two days, but the sentiment hardly changes. There is a striking drop in interest from day two to day three though as the top seventeen retweets drop by almost 90% to around 5.000. This tells us that even the most shocking events seem to not last very long on Twitter and one needs to act within two or three days to get seen by the masses, which is still mostly something reserved for public figures or famous accounts (Simon Cowell, Skynews, BBC, Russell Brand). The URLs used across the four days including the actual day of the murder are by far mostly populated by official news sources. The Telegraph, BBC, The Guardian and SkyNews are presented in various links across the top URLs. Right-wing themed websites do start showing up from day two onwards, like the website of the EDL, but are still not high in numbers. YouTube, and other related video links do show that Twitter and video links can be a popular combination. The video that the assailants shot straight after the murder with a cellphone is rising to the top fast after the news has become wider spread. The fourth day of the aftermath also seems to deal with the growing tensions in Great Britain but also across the globe. Celebrity Russell Brands blog rises to the top of the URL list for that day in an effort to preach for equality. There are also news reports relating to former investigations on the two assailants as well as reports dealing with violence on mosques as a reaction to the event. These tweets show a sentiment of fear and confusion as people get to know more about the two murderers that have been citizens of London for years. Aside from the URL relating to Russell Brand there is, just as in most other categories of the tweet elements, a sharp decline in relevant tweets. Looking at the most mentioned users on Twitter on the day of the Woolwich murder, the top thirty exists almost exclusively of news websites and journalists such as the BBC (Breaking), Sky News and Piers Morgan. But as we saw in the Retweets section, some individuals were retweeted as well, such as ex-officers being positive about muslims in general instead of spreading hate speeches. The English Defence League was mentioned a lot as well, but this does not mean that all the mentions are based on negativity towards muslims. Instead, lots of tweets naming the EDL are refuting the point of view the EDL holds. The day after the murder, the amount of the top mentioned mentions was even bigger than the day before. Nevertheless, the substance of the top mentions was almost the same; official twitter pages of news websites, journalists, writers and a few ex-officers of the British Army are responsible for almost all the top mentions. The two days after that, the amount of tweets and thus mentions fell down pretty fast. The negative twitter accounts that were there however, particularly the ones that are associated with the EDL, shifted more towards the top mentions than at the day of and the day after the murder. At the last day of our measurements, @AbuNusaybahUK was mentioned a lot as well - not propagating muslim hate but the opposite: justifying the murder. We have collected a total of 6398 on the first day of the trial. As we can see in pie chart 1. 79,8% of the top hashtags are made up of only 2 hashtags; [Woolwich] and [leerigby]. Strikingly enough, the sixth most used hashtag is [Islam] with a frequency of 76 mentions. Other Islam related tags were [muslims] with 58 mentions and [muslim] with 29 mentions. Two days after the trial the total used hashtags went down to 1942, again the most used hashtags were [Woolwich] and [leerigby] now making up 61.2% of all total hashtags used. [Islam] was only used 37 times and [muslim] 27. Just looking at the numbers we can see a steep decrease in Twitter activity regarding the Lee Rigby murder trials. Compared to the first day after the trial, we can see that there were less than 5% of hashtags used relating to the murder trial on December 21st with a total of 301 mentions divided in just four hashtags. In total there were only four hashtags used in the dataset around the Woolwich trial. Although interest has decreased significantly, the most used hashtags were still [Woolwich] and [leerigby]. Twitter and hashtags frequency has stabilized two days after the trial with a total of 297 total hashtags used. As we can see in pie chart 4 not much has changed since the previous day, only the two most used hashtags directly relate to the trial with the two other hashtags being [Job] and [AFC] (referring to Arsenal Football Club). Again, as we can see, interest in the trial decreases quickly after only two days. Looking at the retweets done during the time of the trial we can distinguish a few things. Firstly the dominance of official news sources that have been retweeted, but only on the first day and at the very top, namely BBC, SkyNews and Metro. British artist Lorde also features heavily on the day of the trial, constituting half of the top 30 retweets for the day, with either her own tweets or interplay with the account. What is interesting is that it takes a day for the more sentiment filled tweets to start showing up. On the 20th of December 2013 there are more tweets which diverge from facts and start expressing opinions. The top retweet of this particular day is a blogpost by comedian Russell Brand vouching for mutual respect between different people. News sources have been substituted for anti-islam accounts like @AtlasShrugs and @TimRobinsonNewsEra, the founder and ex-leader of the English Defense League, which both appear tens of times in the list. This trend continues the next two days but the Woolwich incident is also increasingly being used to divert attention to other topics. Other unrelated cases start using the Woolwich hashtag so they can be seen, asking attention for other cases of terrorism and mayhem. An important sentiment that can be seen is that people use the hashtag to point at that this news does not get mentioned because: the suspect is not black or Muslim. These retweets have changed from mainly factual, to angry and accusing and finally are used as tools to highlight different news. Whereas the top retweets on the day of the trial were mostly dry facts about the trial, the top URLs seem to be aimed at the assailants and accusations surrounding the murder of Rigby. Woolwich Murder Muslim Leader Warns of War is the top used URL on this day, which reflects a sentiment of danger, fear and hate. Most of the focus in URLs seems to lay on the two suspects and their relatives, such as a brother who gave an interview on the act. There are also a lot of URLs from non-british organisations or news sites which are getting used here, namely the news of Al-Jazeera. Just as with the retweets, the topic of the URLs shifts over the course of the next days. The next two days after the trial, the URLs start focussing more on the murder as a spark that reignites the hate between east and west. Muslims Feel Targeted over Woolwich Killing and The Murder of Lee Rigby had Everything to do with the Worst Version of Islam are examples of this. The last two days also see a sharp drop in URLs concerning the topic, where URLs on the third day after the trials are mostly related to other events that share some keywords of the query (A British doctor in Pakistan.. and Muslims allowed to refuse to serve alcohol or pork to customers are top shared URLs). What is most obvious about the mentioned users on Twitter during this four day period is that Tommy Robbins is by far the most popular. The days after the start of the trial, Anjem Choudary, who co-created the group Al-Muhajiroun (to which one of the suspects was affiliated with), got mentioned a lot as well. He created a lot of sentiment saying things such as that the murder was justified, which obviously elicited a reacting from many people (mostly negative, but also positive). Just as with the other elements in a tweet during the trial, it can be seen that anti-Muslim accounts rise to the top after the initial day of the trial, such as @AtlasShrugs and @JihadWatchRS. Relevance also declines the further we get into the list as the Mark and Spencer story starts to take hold in the top, which is unrelated to the Woolwich case. Just as with the other elements, the story of the Woolwich trial only seems to really peak in the initial days, and then declines quite rapidly, both looking at relevance of the top tweets as well as the low number of overall tweets containing our queried keywords. This graph shows a twitter sentiment analysis of tweets on the day of the woolwich murder and three days after the murder. The graph, taken from the DMI Twitter Capture and Analysis Toolset (DMI-BTCAT), shows clearly that most tweets had a negative tone. What is also clear, is that tweets became less negative during the days after the event. This second graph shows a similar story, but with a more negative start and a bigger decline of the negative tone. In general the tweets where the most negative on the day of the two events. Because this research is about sentiment analysis of tweets we tried to use the SentiStrength tool to do so. We wanted to export all tweets from our selection, so we would get a file that contains all tweets and information about them (user, date created, ...). But, unfortunately we were not able to do this. In the three days we had, the tool gave the same error everytime we tried to use it, a 502 error. Furthermore, the dataset contained a high degree of tweets and hashtags which relate to Woolwich, but not necessarily to the Woolwich murder. Accurately measuring sentiment would require a close reading of relevant tweets and even then there is the issue of proper coding and interpretation. What we can see however, is what topics and terms are deemed relevant in the aftermath of the murder. Here we can see that the EDL is increasingly getting more prominence in the discourse around the murder. The most obvious reason for their high visibility is the outburst of violence the EDL caused in the aftermath of the murder. The EDL took it to the streets and consequently clashed with local law enforcements, throwing bottles at the police, chanting anti-Muslim slogans and attacking mosques. There has also been an increase of openly supporting EDL across other social media platforms such as Facebook. The publicity of the EDL not only breeds support but also counter-support as both sides become more vocal after the Woolwich murder. This explains why the [EDL] becomes such a big part of the whole discourse around Lee Rigbys murder. A key finding in this paper is that the people who tweet negatively about the EDL are judged during the time of the murder and to a certain extent as well during the trial. However, during the trial time period the far-right movements seem to gain the upperhand when it comes to relative numbers compared to the period in May. Although the SentiStrength program is a useful tool to analyze a lot of tweets there are some complications as well. We checked a small number of tweets to check how the SentiStrength program would react, by doing this we found some troubling results. The tested tweet youre a waste of sperm your mother should have swallowed you for instance is marked by the SentiStrength programme as mildly negative (-2). However, the tone and sentiment relayed in this tweet suggest a much stronger negative emotions than just mildly. This raises some questions regarding the SentiStrength graph accompanying the data. Is the graph reliable if arguable results like this make up the daily average? In this research we used the twitter dataset from the provided by the Digital Method Initiative through the capture tool. Although this tool is useful and has provided us with a lot of data there are also some remarks. Firstly, the tool uses different search queries to collect and gather the tweets. Some of these search queries are words that are not only used or related to the woolwich murder or trial. The term Woolwich for instance does not only refer to the murder case but can refer to the area in London where the murder took place. If someone has a (unrelated to the murder) bad time in Woolwich and tweets this, it will affect the eventual SentiStrength graph as well. Secondly, there were some tweets captured based upon certain user, such as @BritainFirst. However, not all the tweets of this user are about the murder or the trial. Because of this we have checked a thousand random tweets, using the same took, and found out that 15.60% of the tweets were not related to either the Woolwich murder or the Woolwich murder trial. Because of the limitations of this research, namely time and resources there was no option to filter these tweets in more detail. As a result we would recommend a more extensive analysis of the tweets for future research. By looking at the two time frames related to the single murder case of Lee Rigby our goal was to extract sentiments from Twitter and compare them to each other. The research question we tried to answer was the following: How does sentiment as seen on Twitter change when comparing twitter data of two major events regarding this topic? To answer this question we decided to look at the tweets from four angles: hashtags, retweets, URLs and mentions. The tweets during the time period surrounding the murder showed us that, maybe surprisingly, most tweets were not aimed at Muslims and the Islam but rather at far-right movements. Especially the English Defense League received a lot of negative sentiment for their rash reactions over the acts of two people. Compassion, sympathy and a call for equality are high scoring topics when it comes to tweets in these categories, but especially retweets and mentions. Top linked URLs were mostly related to news websites and the occasional right wing article. The tweets we analyzed during the period of the trial of the murder were slightly more grim. The retweets, URLs and the mentions studied of these tweets all show a higher degree of anger or hate towards the killers and their religion. Right-wing themed accounts and links show up more frequently here than after the killing. One could say that people had more time to think it over or actually got a chance to see cell phone recorded videos of the event which made them change their mind, and their sentiment through their tweeting behavior. The relative similarity in positive sentiment on both graphs could be explained by tweets of compassion surrounding the murder, such as wishing the family strength and peace to the deceased. Subsequently the higher negative sentiment could be explained by looking at our results of analyzing the tweets: hate and accompanying harsh language would result in a more negative average in sentiment. This could also explain why negative sentiment during the murder is less intense: all the negativity surrounding the EDL is not described in terms of hate but rather in terms of disappointment and distancing, which are arguably less negative emotions. Fox, Elaine. Emotion science. Basingstoke: Palgrave Macmillan, 2008. Holt, Richard. Twitter in Numbers. The Telegraph. 14-01-2014. <http://www.telegraph.co.uk/technology/twitter/9945505/Twitter-in-numbers.html>. Thelwall, Mike, Kevan Buckley, and Georgios Paltoglou. "Sentiment Strength Detection for theSocial Web." Journal of the American Society for Information Science and Technology 63.1 (2012): 163- 173. ------------ "Sentiment in Twitter Events." American Society for Information Science and Technology 62.2 (2011): 406-418. Wang, Xiaolong, et al. "Topic sentiment analysis in twitter: a graph-based hashtag sentiment classification approach." Proceedings of the 20th ACM international conference on Information and knowledge management". ACM, 2011. "Woolwich Attack: The Terrorist's Rant." The Telegraph. Edward Roussel. 2013. 14-01-2014. 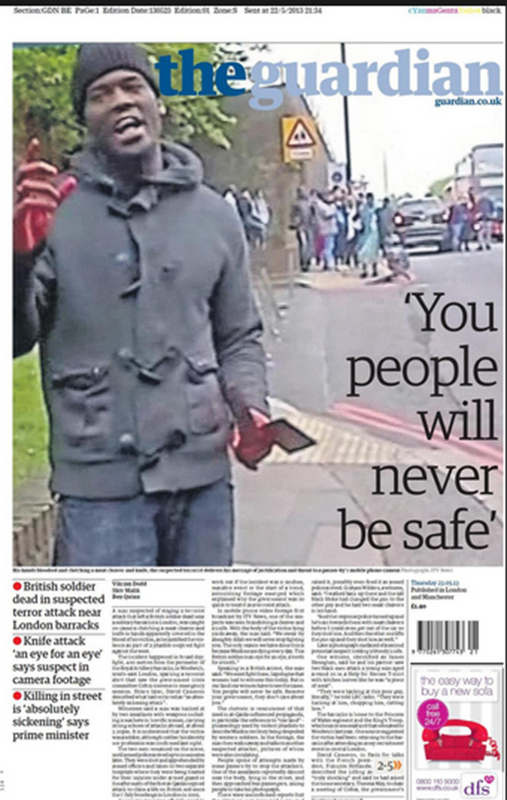 <http://www.telegraph.co.uk/news/uknews/terrorism-in-the-uk/10075488/Woolwich-attack-the-terrorists-rant.html>.